Three main types of wet scrubbers are used in the chemical process industries (CPI) to remove contaminants from gas streams. The differences and suggested applications for each are discussed here. Pollution control equipment is fundamental to chemical process industries (CPI) facilities. Scrubbers are a type of pollution control equipment that are frequently mandated by regulation to promote environmental health and safety and can help recover product. Scrubbers fall into two generalized categories, wet and dry. This article focuses on wet scrubbers, how they operate, and advantages and disadvantages of each type. Wet scrubbers use a liquid to remove pollutants from a contaminated gas stream via absorption. In most cases, the liquid is water, as it is readily available at most facilities. It is common to include a chemical additive in the water so that the pollutants undergo a reaction and are converted to a less-hazardous compound. The most common chemical is sodium hydroxide, or caustic (NaOH). Because it is a strong base, caustic is an excellent scrubbing agent to remove acid gases, including hydrochloric acid (HCl) and sulfur dioxide (SO2), and can also be used with hydrogen sulfide (H2S), mercaptans, and certain organic macromolecules such as fatty acids. Some facilities use water alone and forgo the use of chemical reagents. Three main types of wet scrubbers are used in the CPI today: jet venturi fume scrubbers, packed towers, and high-energy jet venturis. Each design is appropriate for certain applications, and knowing which scrubber to specify is an important part of the design process. The jet venturi (Figure 1) is the most basic wet scrubber. In this setup, a pressurized liquid is passed through a nozzle and expands as the pressure decreases to atmospheric conditions. This creates an area of low pressure, which draws the gases into the head of the jet venturi. This two-phase mixture is compressed in the converging nozzle. 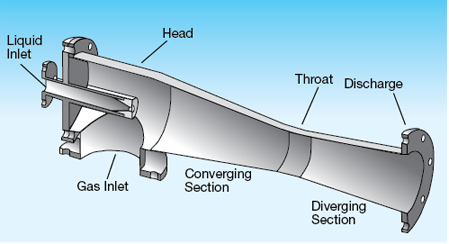 In the throat section, the narrowest point of the venturi, the two fluids are well-mixed and the liquid absorbs the gaseous pollutants. The clean fluid then expands to a gas through the diverging section, slowing as it reaches the outlet. Table 1 summarizes bulk removal efficiencies for different pollutants. ▲Figure 1. A jet venturi fume scrubber can remove moderate to large particles from a stream with a high liquid-to-gas ratio. Table 1. Removal rates in a jet venturi for pollutants at ambient conditions depend on the contaminant and the type of chemical scrubber used. Because most scrubbing applications include high concentrations of noncondensable vapors, the jet venturi scrubber typically discharges the stream into a separator tank. This tank is sized to accommodate the two-phase fluid with sufficient residence time to allow the gaseous phase to separate from the liquid phase. From this point, clean gas is either vented to atmosphere or sent to a second jet venturi or a packed tower for additional removal.